I recently was asked by a dentist to intervene and mediate a dispute that had arisen between two front desk employees in his office. It doesn’t matter what the conflict was about – what really mattered was that both employees were valuable members of the team and my client wanted to keep them both. He was at his wit’s end however, as to how to resolve the tension between them. Who would have thought that Smarties would help? The first thing we did was all sit down at a table together. We made some agreements about how to speak and be respectful of each other. We referred back to some of the communication techniques the whole office had been working on with me in past, such as recognizing story and assumption, avoiding defensiveness and blame, using “I” words and eliminating always/never from our vocabulary for this discussion. After we made some agreements, we began to talk, each in turn, about what each had observed, how they felt and what they needed. And here’s where the Smarties come in. 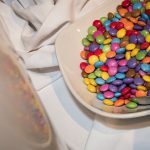 At some point in the dialogue, one of the employees who had been helping herself, almost nervously, from a small dish of smarties on the staff room table, made a small gesture. She moved the dish of Smarties towards the other person, making an offer. So what, you say? As a big fan of Dr. Richard Gottman, The Relationship Cure, I recognized this as a “repair bid”. This is any small gesture of kindness towards the person you are angry at. It can be a smile, a knowing nod, an offering of any kind that is like an olive branch. How many times in your life have you missed this from a spouse or adversary? You might have been so mad that to acknowledge this ‘repair bid’ seemed like giving in and so you chose to snub it. Pushed it away. Big mistake. These small gestures ARE olive branches. They are the first step toward resolving conflict. Snubbing them actually escalates the conflict and an opportunity is missed. One thing you can be sure of, these ‘repair bids’ are essential to leading conflict down a path toward reconciliation rather than escalation! Watch for them and understand their significance. A repair bid is an opportunity, no matter what form it takes. It’s never about the Smarties.